During a flood it is often difficult to obtain accurate and real-time information about the extent of the flood and the people affected. This information is important, particularly for crisis relief organisations, in terms of further reducing risks and taking the right measures. In a joint study, two Dutch organisations - Deltares and Floodtags - have developed a proof of concept to derive real-time flood-extent maps based on tweets about floods. At present, flood-extent maps are derived from a limited number of sources, such as satellite images, areal images, ground observations, hydrodynamic models and post-flooding flood marks. This information is usually supplied after the event. However, it still remains difficult to obtain accurate real-time flood-extent maps. The emergence of social media has provided us with a new data source that contains large numbers of real-time observations from local people. In the city of Jakarta, the Twitter capital of the world, the intensity of uniqu e flood-related tweets during a flood peaked at almost 900 tweets a minute during floods in February 2015. A significant number of these tweets include information about water depth and location. However, uncertainties arise because water-depth observations are generally rough estimates. If disaster managers are to use this cloud of observations, the data need to be filtered, enriched, validated and transformed into easily interpretable flood-extent maps. FloodTags and Deltares developed a procedure to use the thousands of observations generated by the social media. By applying statistics and using hydrodynamic corrected Digital Elevation Maps, they created real-time flood-extent maps for Jakarta. 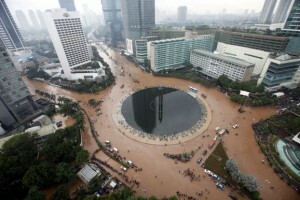 The real-time flood-extent maps provided a good comparison with ground-truth photographs in most neighbourhoods in Jakarta. This method can be scaled easily for any place in the world with enough Twitter activity. When implemented in an operational warning system, the method will create real-time maps based on tweets that people have sent a minute previously. The maps are also useful in the post-flood phase for the calibration of hydrodynamic flood models and for insurance companies to obtain rapid information about areas where damage has occurred.